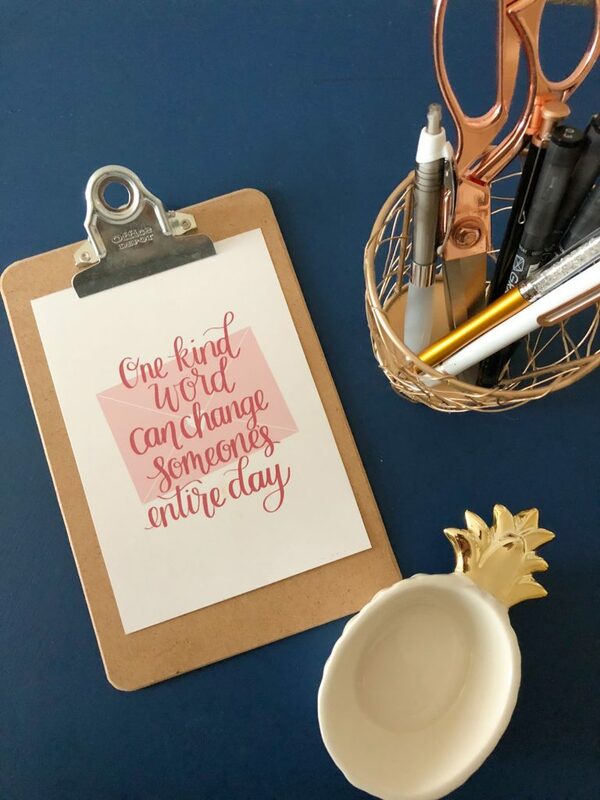 National Handwriting Day + Free Printable! Happy National Handwriting Day! I have always LOVED writing things down. I know, that sounds weird even as I’m writing it here… but there’s just something about putting pen to paper that is so soothing to me, even if it’s just when writing down my to do list or grocery list. I keep a physical planner, to do lists, and I have notebooks all over my house full of sermon notes, podcast notes, random ideas, and doodles. Call me crazy, but I will always be a pen and paper girl! Which is why this day is so exciting to me! If you don’t believe that this is a real day 1) May Designs told me so in my planner so there you have it, and 2) go look at the hashtag #NationalHandwritingDay right now and try to tell me that you didn’t catch yourself scrolling for more! I could scroll through pictures of beautifully addressed envelopes for hours which is probably strange, but it gives me so much inspiration. I’m a huge proponent for the handwritten note, something I believe that my generation has started to get away from, and so I try to send out snail mail and write little notes to my people as much as I can! Words of affirmation is my love language, so if I could spend my days writing love letters to my friends and family, I’d die happy. There’s never an occasion too small to give someone some handwritten encouragement or ask them about their day. I think I gained my love for handwriting because of my crazy talented, artistic mom, who has always had the most perfect handwriting of anyone I’ve ever known, even when she’s signing a check. So for my whole life I’ve tried to practice and emulate her handwriting! In high school I really started getting interested in hand-lettering, and it’s been a love affair ever since. My mom now has her own hand-lettering business, Art and Soul, and it’s so fun to get to help her find ideas and inspiration for her art! 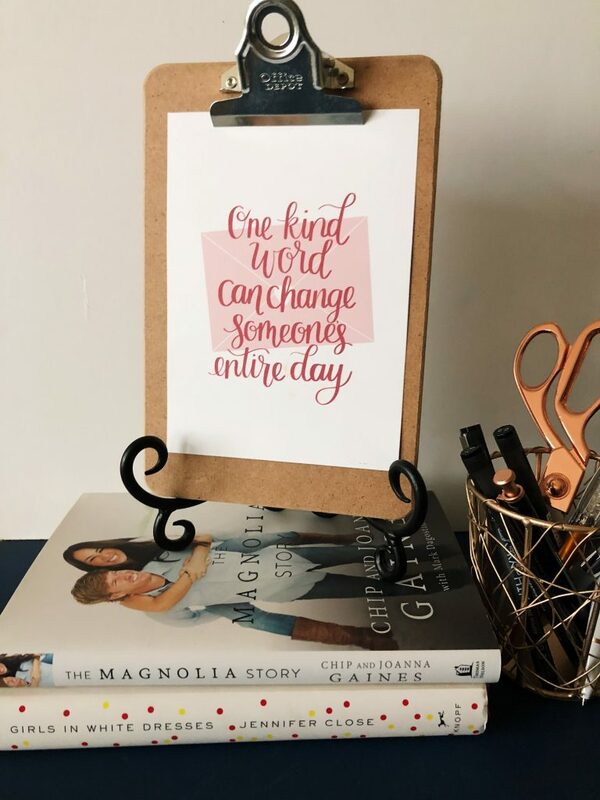 So in honor of National Handwriting Day, she has created the most beautiful free printable for us! It’s such an amazing reminder to share kind words and encouragement with others that I think everyone can benefit from. I printed mine out in 5×7 size and have it sitting on my dresser where I can see it as soon as I wake up! So download your print below and put it somewhere where you can draw some daily inspiration from these words, and who knows, you may even be inclined to send out your own snail mail! Be sure to follow @ArtandSoulAR on Instagram, and let us know if you grab this download below! We want to see where you put it!